Last week, the project has presented its results of the second year to the review panel. This encompassed the results of the representative studies and their implications on the knowledge maturing model as well as the demonstrator development, which brings together conceptual advances, architecture and integration work, and formative evaluation. The whole team has put tremendous effort in the preparation of the meeting, particularly because it was a very early project review. 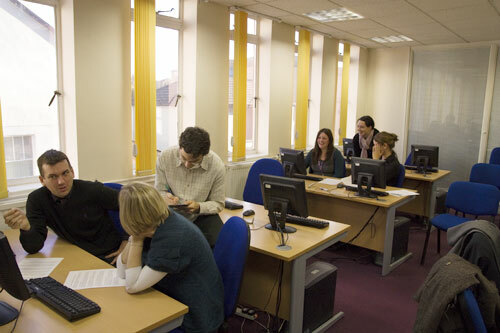 MATURE workshop at JTEL Summer School 2010: Womble (Work Oriented MoBile Learning Environment). The JTEL2010 organising committee has accepted our contribution and included it in the preliminary programme which you can see posted at the Summer School website, which contains the workshop description: http://www.prolearn-academy.org/Events/summer-school-2010/index_html. The workshop is in 2 parts (on Monday and Thursday). JTEL takes place in Ohrid, Macedonian, 7th June 2010 to 11th June 2010. John will be funded by MATURE to represent LTRI. Representatives from those companies will join the associate partner meeting on April 16 in Vienna. Semantics and Deep Learning Design for Technology Enhanced Learning: Towards a â€˜smarterâ€™ web? This talk considers a number of projects in Technology Enhanced Learning (TEL) that have focussed on designing advanced digital tools that stimulate and support dialogue rich learning. 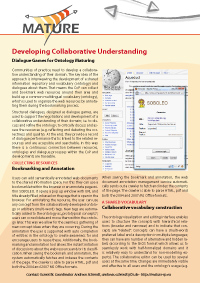 These have emphasised collaborative thinking and meaning making in a rich and varied range of educational contexts. Technically, they have exploited AI, CSCL and HCI techniques, and ongoing projects are incorporating social software and semantic technologies. LEARNTEC is the leading international trade fair and convention for vocational education, learning and information technology. 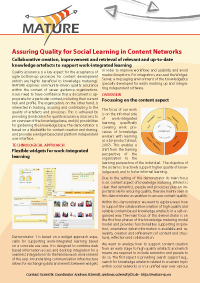 It provides information about different approaches to learning, using online and traditional media, which are both effective and free of time constraints. At this year's edition, Prof. Rudi Studer, director at FZI and professor at the Karlsruhe Institute of Technology, was invited for a talk on Knowledge Management 3.0, in which he presented the MATURE approach and the people tagging demonstrator as a lightweight semantic approach to knowledge management. Google Goggles - a tool for work based learning? Is Google running short of imagination. Not when it comes to applications - there seems to be a new product announcement almost everyday. But Google Goggles - who thought that up? Its a terrible name. But in terms of developing a work based mobile learning platform it may represent a big step forward. Goggles is a very simple application. You merely point your Android phone at an object - a building, an object, an artefact - and it produces search results based on the image (Google say they will be porting it to other platforms in the future). Some preliminary thoughts on the nature of what I am calling Augmented Contexts for Development; an extension of Vygotskyâ€™s Zone of Proximal Development that takes into account the characteristics of 21st Century mass media structures and practices. Presentation at Education in the Wild, Alpine Rendez-Vous, within the framework of the STELLAR Network of Excellence. December 3-4, Garmisch-Partenkirchen, Bavaria, Germany. I will talk with colleagues in Garmisch about extending my notion of Augmented Contexts for Development to work based learning. I would welcome any comments from MATURE colleagues about how it relates to the MATURE model. Slides for my talk: available in slideshare http://bit.ly/7VsaOB. Cook, J. (in press). Travelling Without Moving: Design-Based Research into Augmented Contexts for Development. Journal of Interactive Media in Education. Invited paper for special issue from the CALRG 30th Anniversary Day. Contact me for a copy. Last week a hands-on workshop took part where representatives from Connexions Kent met with the demonstrator 1 team to finish the first phase of the demonstrator evaluation process. The workshop aimed at identifying usability issues (Does the demonstrator support the individual and organisational tasks it is intended for?) 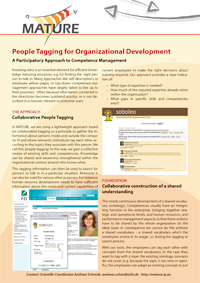 as well as non-functional requirements (Are people motivated to contribute knowledge?). Guided Walkthroughs with end-users from Connexions Kent led to a very valuable feedback and additional requirements. This feedback will be used to improve the demonstrator before the second evaluation phase that will involve a small pilot group in a realistic work setting. MATURE organized a track at this year's edition of the Professional Training Facts conference, which is an "industry meets science" event targeted at "learning - competence - performance". 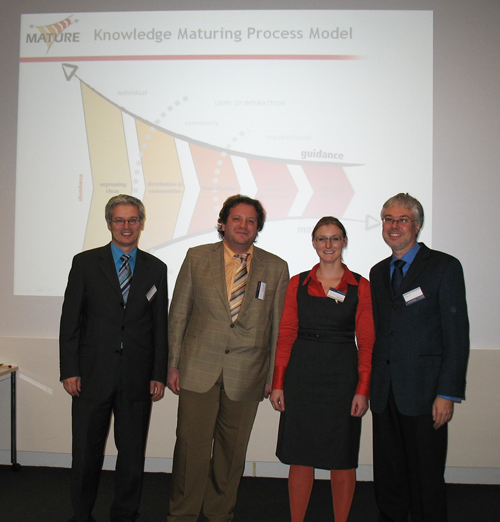 The MATURE track was about continuous competence development, focussing on one of the main aspects of MATURE: the continuity of learning in organizations.